Thousands of useful and fascinating videos can be found at WordPress.tv from the range of talks held at WordCamps and other WordPress-related events. Think of meetups, interviews, testimonials, WordPress Translation Days, and so on. Did you know that there are close to 10,000 videos on WordPress.tv? That’s a serious archive right there. Started in January 2009, we’ve come a long way. People from across the WordPress community donate their time and skills to present these talks. From developers and designers to content creators and community representatives. These professionals and enthusiasts share their experiences and knowledge freely with others. That’s open source! The volunteer WordPress.tv team support WordCamps and the community on making these videos available and managing the resource. These videos also need subtitling. And that’s where you could join in! Subtitling is important and you can contribute without needing any coding skills. Why do WordPress.tv videos need subtitles? There are so many wonderful and informative videos published on WordPress.tv. Unfortunately, only a very small number of them offer subtitles. Why does that matter? 1) Foremostly, a subtitled video is more accessible. Subtitles assist people with hearing difficulties to share the experience of the talk and access the information within it. 2) The text can enable people to watch a video without needing sound. This can be, for instance, when accessing it at work or on the train. 3) Subtitles could also be translations. They help people that don’t fully understand the talk in its original language. For instance, an English talk could also have French subtitles. 4) Subtitles can reinforce professional development opportunities and with deciphering unfamiliar jargon or terms. WordPress.tv video segments are used by some WordPress Meetups. Subtitles can help with access for their audiences, general learning, and aid participation. 5) The subtitled text can also be used on other channels if the video or part of it is featured as part of a WordCamp promotion on other video platforms, such as Vimeo or YouTube. As the WordPress Marketing team, we will be featuring useful videos of WordCamp talks during the next months. We hope that doing so will, among other things, inspire more people to join in and subtitle videos on WordPress.tv. Let’s make these videos more accessible so they reach a wider audience! Great subtitling tools are available at no cost, like Amara.org. Amara offers an easy interface in which you can enter subtitles and set the correct timings while watching the video. It’s also easy to use when creating subtitles in a different language than the video is in. The WordPress.tv team has done a great job explaining how to add captions or subtitles to a WordPress.tv video already. 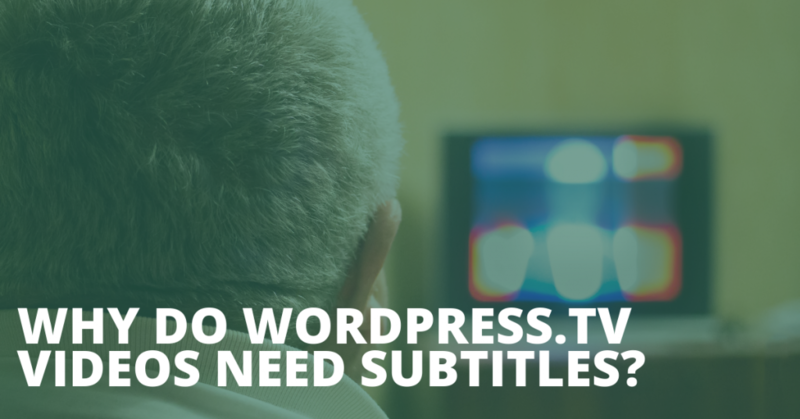 Here’s a great short video that walks you through the steps of subtitling for WordPress.tv. Quite easy right? Amara lets you save your progress so you can get back to it at any time. That way, even if you only have a few minutes to spare, you can add another few lines of subtitles. At the moment, the WordPress.tv team is uploading videos to YouTube as well. YouTube adds automatically generated subtitles, which can be edited afterward. This could make things a lot easier! Check out the WordPress YouTube channel. For subtitling, all you need to do is watch the video and write the lines that you hear, in the language they’re spoken. If you are so inspired by the video talk, you can add a translation too! A lot of videos on WordPress.tv are English spoken. Adding other language transcripts increases accessibility and usability for these wonderful resources. Subtitling is a flexible way of contributing. You can work on specific subtitles when and where you want to. You could work on them for a couple of hours or for ten minutes at a time. The length of videos also differs: short and long are videos available for subtitling. Take your pick! Visit WordPress.tv, find a video that you enjoy and get started. Of course, it’s a good idea to check if the video has already been subtitled. Most of them aren’t, which is why it would be great to have you helping out. We will be featuring regular blog posts on the Make WordPress Marketing blog (link: https://make.wordpress.org/marketing/) that highlight videos from WordPress.tv. Thanks to @siobhanseija and @webcommsat for this blog series and leading the project. Thanks to @casiepa and @drbe4t for their input. Thank you to all those who are subtitling the WordPress.tv videos. This is awesome. Thanks to everyone involved for raising this issue and encouraging more people to do what they can to help make information more accessible. It’s difficult to quantify how many times I’ve had to stop watching a video on WordPress.TV because of the lack of captions or poor quality audio. And I’m very certain I’m not the only one either. Even though it requires a bit more effort to put together, at the end of the day, everyone benefits from it. Aside from what has been already been written above about why you should do it (for others), you as a content creator will be able to reach even more people who are desperate to learn from you too. And frankly, the effort that you have done for creating the talks should be “heard” by more people. As I said, there are so many benefits of doing this, and I hope this will be a start of making sure that everyone can access your own content. I wrote about this recently (Conferences, Speakers: Please Caption Your Videos) and noted that overall the volunteers might be better off getting financial backing to pay a service to do it. Experience tells me it can take at least a couple hours to caption a 40 minute talk. I can pay a transcription service $1/minute (USD). At my standard hourly rate it is far cheaper to pay them to do it. To that point, conference organizers need to step up and build that into their budgets, perhaps at the expense of some swag. Creating caption sponsors can be a great way to do that. Speakers who are being covered by their employers should ask for the $40 to caption their own 40 minute talk, as it makes the employer look better. Even some un-supported speakers may want to set themselves apart by doing it. But I think the first thing to do is see how Matt Mullenweg’s commitment last month to caption the top 100 videos turned out and go from there. If he liked the results, perhaps Automattic can get a bulk deal on captioning services.